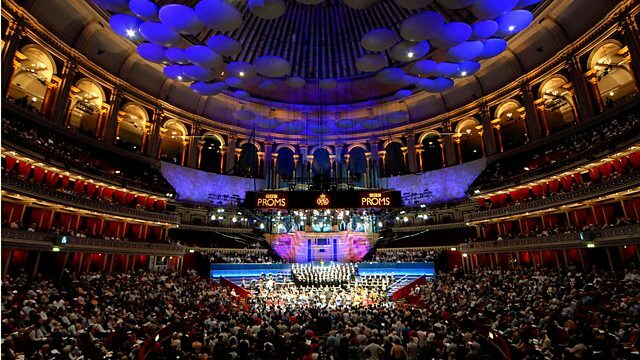 A Prom featuring the BBC Symphony Orchestra and Chorus under Josep Pons. Jonathan Dove: Gaia Theory. Mozart: Piano Concerto No 23 (with Ingrid Fliter). Ravel: Daphnis and Chloe. Monday evening's concert by the BBC Symphony Orchestra and Josep Pons at the BBC Proms. Introduced by Sara Mohr-Pietsch at the Royal Albert Hall, London. Jonathan Dove explores Gaia Theory, Ingrid Fliter in Mozart's Piano Concerto No 23 and Ravel revels in Daphnis and Chloe, joined by the BBC Symphony Chorus. Turbulent mythical love and poised Classical elegance come together in a concert that shifts from Jonathan Dove's large-scale orchestral work Gaia Theory to the intimacy of the Viennese salon in Mozart's ever-popular Piano Concerto No. 23, performed by former BBC Radio 3 New Generation Artist, Ingrid Fliter. Inspired by the work of James Lovelock and continuing Dove's concern to address environmental issues in his music, Gaia Theory takes as its starting point Lovelock's idea that the Earth behaves as a self-regulating organism, and his description of all the inter-related processes maintaining the earth in the optimum conditions for life as a kind of dance. Dove says, "I was struck by James Lovelock's observation that, since life on earth began, the sun has got perhaps 30% hotter, and yet the earth has not. For hundreds of millions of years, the impact of the sun's heat has been moderated by cloud cover, the atmosphere, the albido of the polar ice-sheets and so on, all affected by the behaviour of microscopic organisms as well as by animal and ultimately by human activity, not to mention the respiration of plants and trees and innumerable processes all, as Lovelock describes, "locked in a sort of dance in which everything changes together."" First broadcast 28th July 2014. Conductor: Josep Pons. Orchestra: BBC Symphony Orchestra. Choir: BBC Symphony Chorus. Conductor: Josep Pons. Orchestra: BBC Symphony Orchestra.